Exactly half a century ago or in October 1962, Indian army suffered a most humiliating defeat at the hands of Peoples Liberation Army or PLA of China In Ladakh and Arunachal Pradesh. For ordinary citizens of India, smug and complacent in the belief that India's borders were well protected, it was a very severe shock and a dawn of new realization that in the terms of the Realpolitik of the world, the power of the gun matters most. Unless the country has that power all talk of peace and non alignment were just bubbles in the air. In this series of articles, I want to share with the readers, the blunders committed by India's inexperienced leadership of those years in formulating India's China policy and how they were tricked and fooled by Mao's China. When I remember the agony of those days, a shiver still passes down my spine even today. Let me begin with the political situation, which India inherited from the British. A tripartite meeting of the British administration in India and representatives of Tibet and China was held in 1913 at Shimla in India. A draft treaty was agreed upon during this meeting. This agreement is known as Shimla treaty. 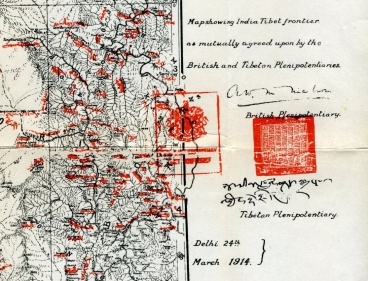 According to the terms of this treaty, the relationships and borders between these three countries, namely India, Tibet and China, were fixed and agreed upon. However, even though the Chinese representative attending the meeting, Mr. Ivan Chen had initialed the draft treaty, he refused to put his country's official seal on the paper. Subsequently, the Government in Beijing declared that this treaty was unacceptable to China. According to representatives of India and Tibet, since the treaty was mainly about the relationships and the borders between two sovereign countries, India and Tibet, they believed that the Chinese representative had merely attended the meeting as an observer and his approval or disapproval had no bearing on the proceedings of the treaty. Eventually another meeting was held in July 1914 between representatives of India and Tibet and the draft treaty was finally approved, initialed and sealed. In this accord, it was agreed that a region spread over 14380 square miles and known as Aksaichin: located east of Ladakh, between Karakoram mountain range and Kun Lun mountain ranges, would be part of British India. The region of Ladakh in those days, was part of the princely state of Jammu and Kashmir. In fact, old references show that the state administration used to have a small police outpost at Shahidulla( Located on present Tibet- Xinjiang road) in this region. After India became independent, the responsibility of defending this region was given to CRPF or Central reserve police force. Since the region became quite inaccessible during winter months, patrols were run by the CRPF during summer time to Aksaichin. There were only two possible routes by which these police could reach Aksaichin. 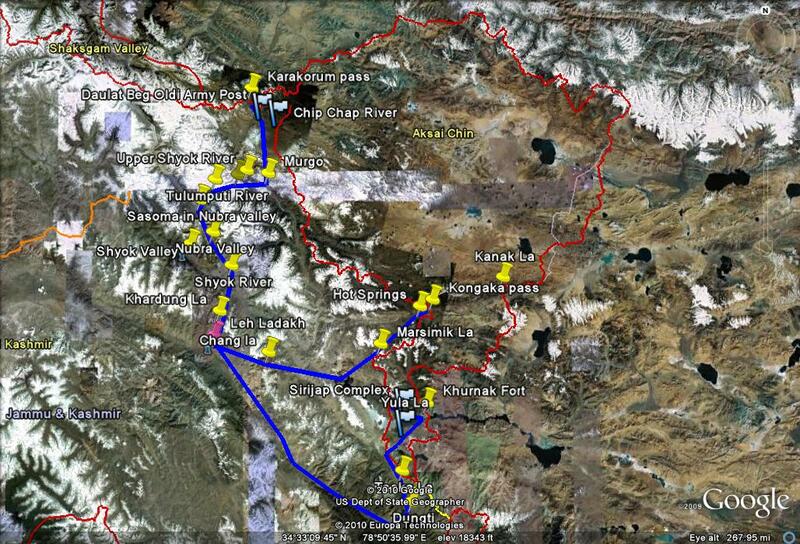 The first route was through famous Karakoram pass and reached up to Shahidulla. The second route was more important and went through Marsemik pass near Pangong lake to Kongka pass and then to Kanak pass on Aksaichin-Tibet border. Before we proceed further, it is important to note why such an inhospitable and remote region was and is so important for China as well as India. 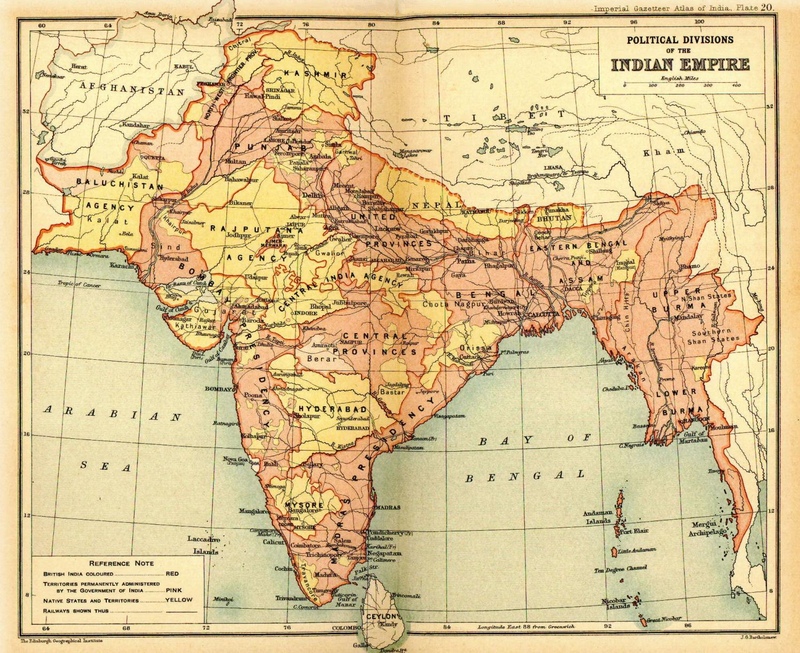 For India, it was country's only gateway to central Asia after the partition in 1947. 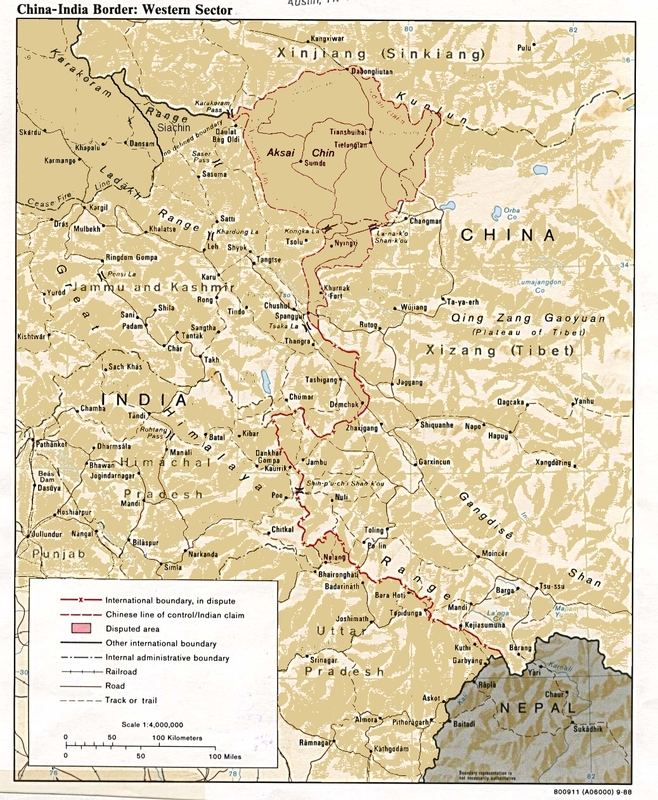 For China, the remote western provinces of Tibet and Xinjiang were effectively separated by Indian possession of Aksaichin and prevented it from movement of armed forces from Tibet to Xinjiang and vice-versa, regions where there was considerable unrest. Sometime in the decade of 1950's, Chinese decided to construct a road joining Tibet and Xinjiang illegally, in the Indian territory. When news of such Chinese activities started circulating in Ladakh, Indian army decided to send an observation patrol to the region. In the summer of 1952, two officers: Captain R. Nath of Kumaon Regiment and Captain Suri of Ladakh Militia were sent by the army to Aksaichin region with a team. 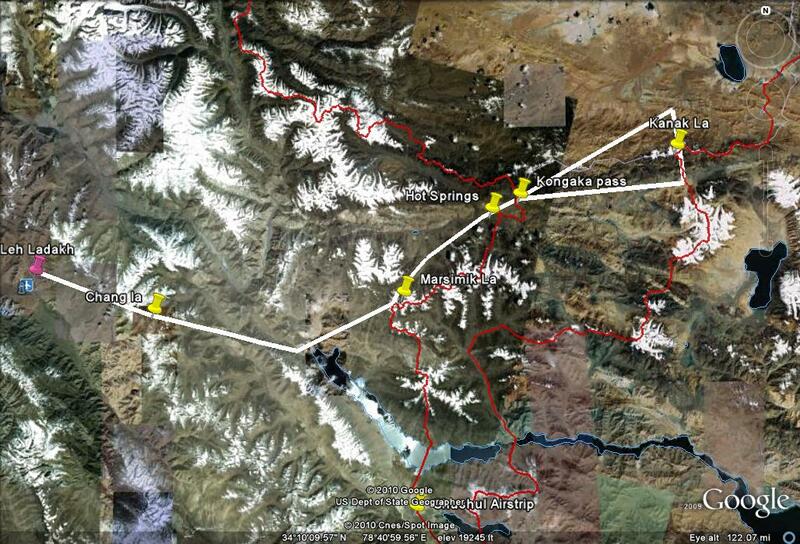 This team entered Aksaichin through Kongka pass mentioned above and travelled up to Kanak pass. During observations they came to know from local shepherds about Chinese surveyors carrying out survey of this region for building a road in Aksaichin. There were no PLA army units in that area then. Both these officers were felicitated and praised for their good work but their report was just kept under wraps. Just imagine that if India had sent army units to Aksaichin then and had prevented Chinese for carrying out the road building work, the entire border dispute, which developed later would have been nipped in the bud. By 1955, Chinese had well established themselves west of Kanak pass. 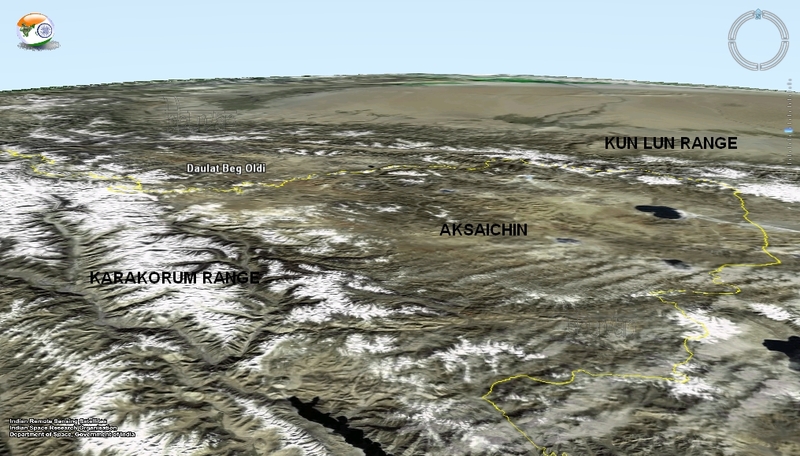 In 1957, they announced that Aksaichin was part of China and the road joining Tibet and Xinjiang was ready. Chief of army staff, General Thimayya wanted to start an army operation in Aksaichin but was prevented by the then defense minister Krishna Menon, who claimed that China was India's true friend. In 1958, two Indian patrols in Aksaichin were made to surrender by PLA and then later released. Unfortunately, all these developments were completely hidden from Indian people by then Prime minister of India, Jawaharalal Nehru, who still thought that China was the greatest friend of India and would never take any steps against India. For China, Nehru's policy of keeping China border activity under wraps was a great boon, as they developed massive infrastructure along the Ladakh borders and built a well planned offensive capability there. Nehru was forced within an year to change his China perspective, as two major incidences took place. The first incidence out of these two, was the uprising in Tibet against Chinese rule and subsequent asylum asked by Tibetan head of state, Dalai Lama in India. This had major repercussions on Nehru's China policy. Many in India started criticizing Nehru for his soft attitude towards China and wanted India to take strong steps to counter Chinese menace. The second incidence is known as “Kongka pass incident” and was essentially caused by complete lack of co-ordination in Delhi between Home ministry controlling CRPF, and defense ministry with Krishna Menon in charge as a minister. By September 1959, Chinese had encroached upon Indian areas outside Aksaichin and their army units had started even arresting the Indian border police on routine patrol. Indian Government was still not ready to take any action and on the contrary asked the home ministry to stop border patrols. India's home ministry, controlling the border police, probably were unaware of Chinese build up in Ladakh and what was happening inside Aksichin, and decided to take counter action on its own against Chinese. Home ministry ordered Deputy Superintendent of Police or DSP Karam Singh to take a team of 40 policemen and establish police outposts In Kongka pass area with the first post to be established at Hot Springs. 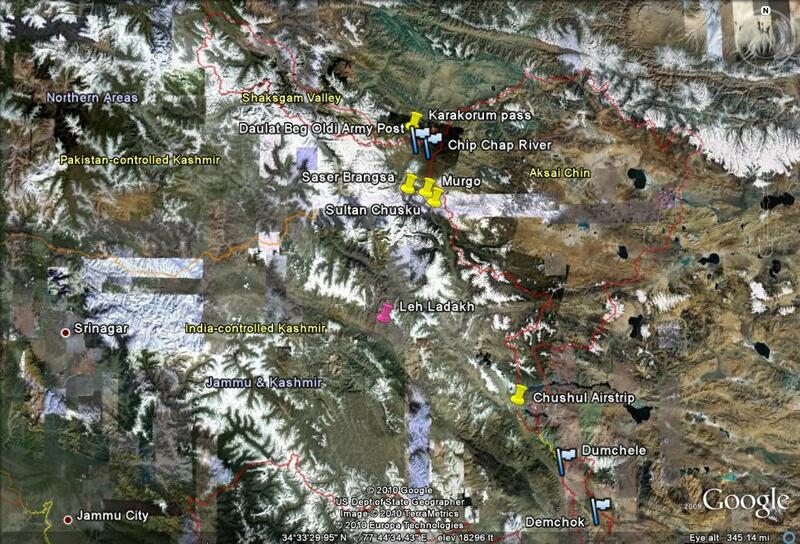 DSP Karam Singh reached Hot Springs on 20h October 1959 and then started surveying the area for further action. He was not aware at all about the fully equipped PLA soldiers entrenched in that area. DSP Karam Singh's troupe was quickly surrounded by the PLA soldiers and was asked by them to leave. In an extremely defiant gesture, DSP Karam Singh bent down, picked up an handful of dust and touched it to his heart, indicating that the land belongs to India. When Indian media came to know about this, DSP Karam Singh and his team became national heroes overnight. But that was too late. At Kongka pass DSP Karm Singh's team faced complete massacre. They just could not defend themselves with their WW II .303 bolt rifles against Chinese soldiers equipped with semi automatic rifles, machine guns and mortars. Within few hour, 10 policemen from DSP Karam Singh's team were lost. Realizing that they can not defend themselves, Indians finally surrendered. They were released by the Chinese after 12 days with much torture and only handful unarmed Indian police were allowed to take back the bodies. A police constable ' Sonam Wangyal' describes this scene in these words. The shocking news about “Kongka Pass incident” reverberated throughout India like wild fire. 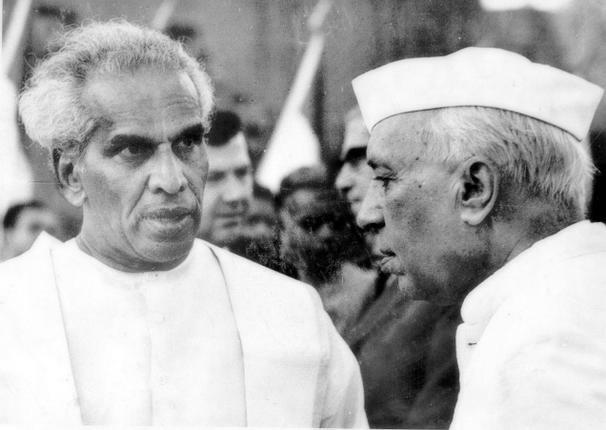 Nehru's China policy was criticized heavily and demands were made to remove Krishna Menon from the post of defense minister. In Delhi, the home ministry was condemned for their foolish adventure by the chief of army staff and finally a decision was taken that all CRPF personnel from Ladakh would be replaced by army units. Meanwhile Prime Minister Nehru faced heavy fire for his China policies. Finally buckling under tremendous public pressure, he announced the so called “ Forward policy” under which, Army would establish forward posts in the areas where Chinese had established control during last few years. Those who knew the current situation, realized the ineffectiveness of this announcement. However, general public in India thought that China would now be paid in its own coins. Sensing India's mood, Chinese suddenly announced that if Indian army ventures out in Ladakh, their army units would move south of the border into Arunachal Pradesh in the north east, where the border was well demarcated and is known as McMahon line. The stage was now set for a major clash between two Asian neighbours. It actually happened 3 years later or in 1962. It is a very good and informative article. I was not fully aware of detailed happenings in those times and feel that many people like me will be properly informed now. Ah well, we were newly independent, naive, ruled by people who never had any experience or even understanding about 'defending' our country. China must have felt like taking candy from a child! One reader of my blog 'Araving the star in rising has pointed out a factual inaccuracy in this post. He points out that ITBP was formed in October 1962 and therefore obviously not involved in this part of history. He is quite right and all the policemen mentioned here actually belong to CRPF. I thank Aravind for pointing out the error.I have made necessary corrections. Very interesting blog. 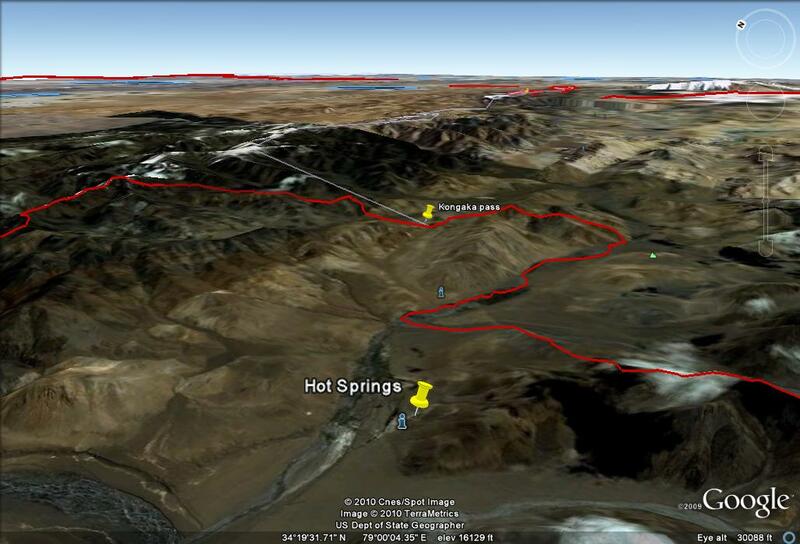 Just a typo; "DSP Karam Singh reached Hot Springs on 20h October 2012"? I guess it would have been 1959. Thanks for pointing out the typo: error stands corrected.